After a perfect sweep through the round robin group stage, a blast through the semifinals, and excellent execution in the finals, GankStars have won the VIPL! The American Express strikes again! The impressive player performances in the finals is something we want to cover in exquisite detail, so look forward to specific match coverage. 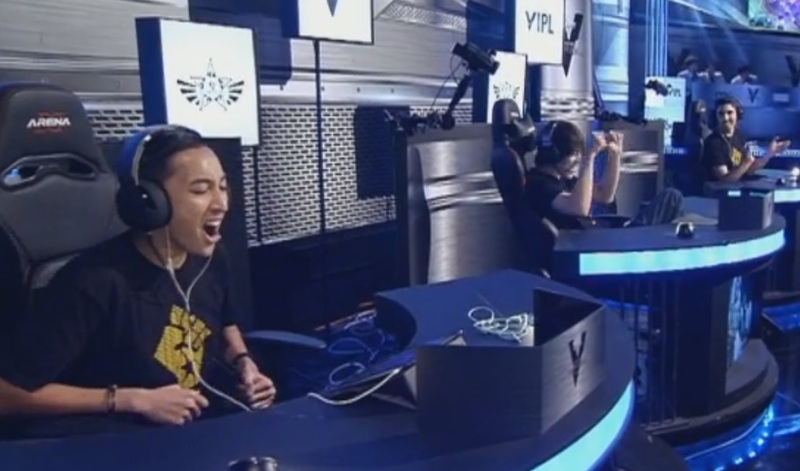 The GankStars were awarded roughly $34,000 USD for finishing first in this tournament. This awesome opportunity is only the tip of the iceberg for the competitive scene for Vainglory. I expect to see more teams challenging our new champions in coming tournaments! Re-watch all of the finals action on Twitch.tv here! Hunters knew that if they didn’t ban Glaive they wouldn’t get to live to regret it. That ban was really straightforward considering the recent murder spree that CullTheMeek was on. Though I had originally predicted a Celeste ban, GankStars decided to ban Ringo. At first this ban didn’t make sense to me because GankStars have the better Ringo player, but GankStars knew they could have a favorable lane matchup, and the only other hero that Godfather had played in the VIPL was SAW. GankStars hopefully weren’t expecting Godfather to play SAW, but I was interested to see what Godfather would revert to with his main laner banned. 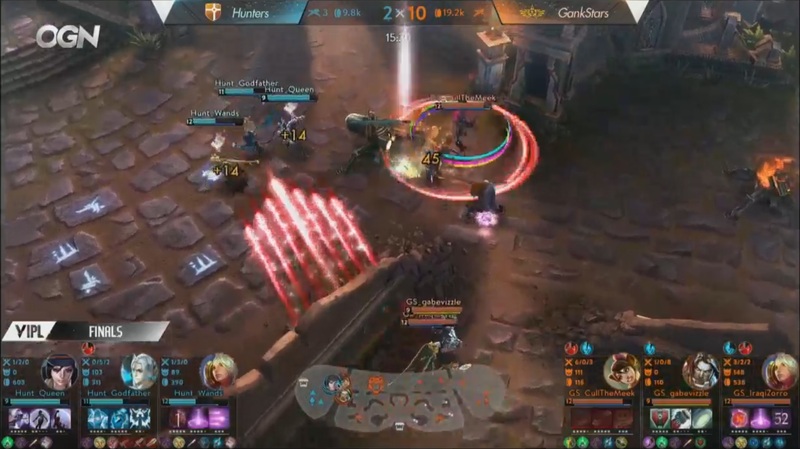 After favoring weapon power comps throughout the VIPL, GankStars showed up with a double crystal power composition, ready to pump out crystal damage. Hunters did their best to stick with their standard lineup, replacing the banned Ringo with lane Adagio. Adagio looked like a solid pick in the opening minutes of the game, with Godfather abusing IraqiZorro with his long auto attack range. The finals of the VIPL were played on patch 1.7, so Koshka was the perfect fit for the composition that GankStars wanted. CullTheMeek quickly built a Fountain of Renewal with its old, more affordable price tag, and had the defense stats he needed to survive the barrage of damage from Hunters. Very early in the game, CullTheMeek and gabevizzle were able to successfully survive an under-manned engage against Hunters that resulted in an ace for GankStars! With CullTheMeek on a bursty front-line tank, gabevizzle on the lockdown daddy, and IraqiZorro laying down poke from a safe distance, the team was a perfect combination of range, engage, lockdown, and damage. This composition is great at sieging turrets, but excels in team fights. After perfect control from start to finish, GankStars accrued double the gold of Hunters, and unleashed the Kraken to siege in for the win. However, two perfectly place Heliogenesis would get Hunters low enough for a Solar Storm to force them away from their turret, dropping Wands in the process. I reached for my DVR remote to rewind this clip over and over again because I wanted to know what happened. Then I remembered that I was watching this game live on Twitch and I couldn’t rewind! I wanted to know how Hunters had just gone from full to almost completely wiped out. Queen wouldn’t survive to her base, and GankStars would finsh the game 28 seconds later. The bans from the first game were used throughout the series, so Ringo and Glaive were not options for either team going into the second game. However, the teams decided to take the exact same compositions, so we were heading into a rematch, just on opposite ends of the map. If you’ve ever played Rock, Paper, Scissors then you know you have to adjust your game after each round. If you play Rock, and your opponent played Rock, then you need to think one step ahead. Going with Paper only wins if your opponent doesn’t adjust. In this match, the game of Rock, Paper, Scissors was in the hero selection screen. I fully expected Hunters to switch something around in their lineup. Adagio only worked in the first few minutes of the game, and then was down 0-5. Celeste, as a jungler, is easily overshadowed by a Celeste in the lane. Catherine’s early-game pressure was quickly overwhelmed by Ardan’s late-game intensity. Hunters would need to make a change heading into this second game. Then they didn’t change a single thing. They started with Rock, and even though they lost to Paper, they were thinking maybe Rock was their best bet at winning, and they would run the risk of facing Paper again. Hunters weren’t ready to go down without a fight. Slightly adapting their playstyle allowed them to keep themselves in this game. They jumped out to an early lead, completely changing their Adagio from a weapon power carry focusing on attack speed, to a crystal carry, focusing on landing a strong Verse of Judgment with a few BrokenMyth stacks. It was a smart adaptation, and it was working to get them a strong lead. With all the crystal builds on both teams, I expected to see plenty of shield purchased on each team. 22 minutes into this game, IraqiZorro had none, CullTheMeek had two tier three shield items, gabevizzle had a tier two shield item, Queen had one tier three shield item in the form of Fountain of Renewal, Wands had none, and Godfather had none. So, while CullTheMeek was basically impervious to damage from Hunters, Hunters hadn’t itemized defense at all. They had been using the lead they earned for themselves to invest in more offense, rather than building to survive GankStars’ damage. This lack of defensive building cost Hunters the game. GankStars bought smarter items through the stretch, and were easily able to catch up. Again, the scaling lane Celeste was always a step ahead, and once Godfather had one poorly timed ultimate, GankStars were caught back up, and were never going to look back. 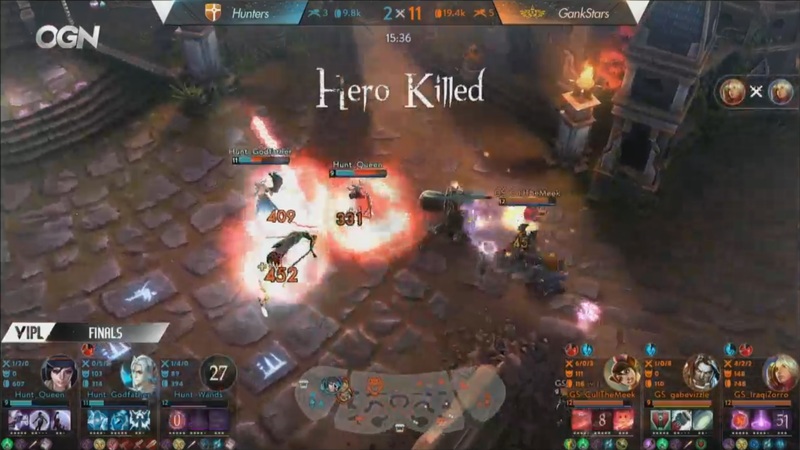 GankStars are one of the best teams at closing out games, and were even called the “American Express” because of how quickly they would end games. VIPL Finals! The Epic Rematch!